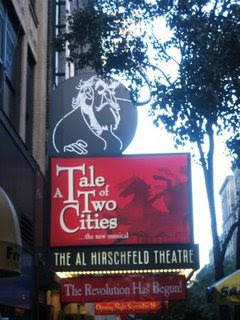 On Wednesday night, Noah took me to see A Tale of Two Cities, which opened last night on Broadway. It also happened to be second press night. From the first moment to the last, I was mostly horrified. I have never seen such poor acting on a Broadway stage. It is overlit and strangely blocked. The costumes are merely decent, albeit appropriate for this period piece. Poor Gregg Edelman looks even more miserable than his character Dr. Manette. Aaron Lazar, who plays Charles Darnay was out, although I doubt it would make it difference at all if he was in. Michael Halling filled the spot. Brandi Burkhardt, making her Broadway debut as Lucie Manette, should have stayed on the beauty pageant stage. Natalie Toro, as Madame Defarge, teters on the verge of camp and can't decide whether to belt or scream. James Barbour, who evidently has a fan base and earned entrance applause, doesn't know what to do with his face - there's no acting there...but the redeeming point of this musical is his voice. It is simply glorious. Unfortunately, the lyrics are ridiculous and the attempt at recitative is just painful. Throughout the show, I involuntarily laughed at the most inappropriate moments. The orchestra sounded so piped, Noah said that maybe it was a cd and the conductor was merely directing to a wall. I can't help but thinking some producer, obsessed with Les Misérables, decided that Broadway can't live without an overblown epic musical. Unfortunately, this is what they chose to fill the spot. Curiously, it seemed to be an audience pleaser. I told Noah at intermission that I had the feeling that some in the audience were repeat attendees. Their enthusiasm at the curtain call made me certain of this fact. I can now say that I saw this mess - the enigma of the flop cult continues, except this isn't one that I'll obsess over. We see this getting a run through the holidays...but I can't see its cast improving because the material just isn't good enough to improve upon. But, did you like it? From what I understand, this travesty was created and produced by $cientologists. Which includes Barbour. I don't think she liked it.